Newly Added Medium Weight Colored Yogurt Spoons! These colored spoons are perfect for frozen yogurt, ice cream and almost anything. Medium weight yogurt spoons is a colorful economical option for frozen yogurt and ice cream shop owners. 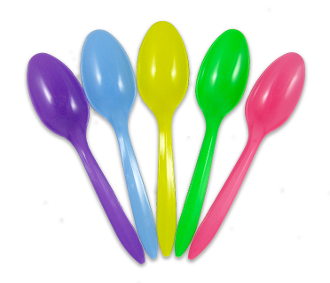 These yogurt spoons are sold as mixed colors (Rainbow:Green, Pink, Blue, Yellow, Purple). Perfect for ice cream, frozen yogurt, and gelato! Visit www.myyogurtsupplies.com for the largest selection of frozen yogurt spoons.